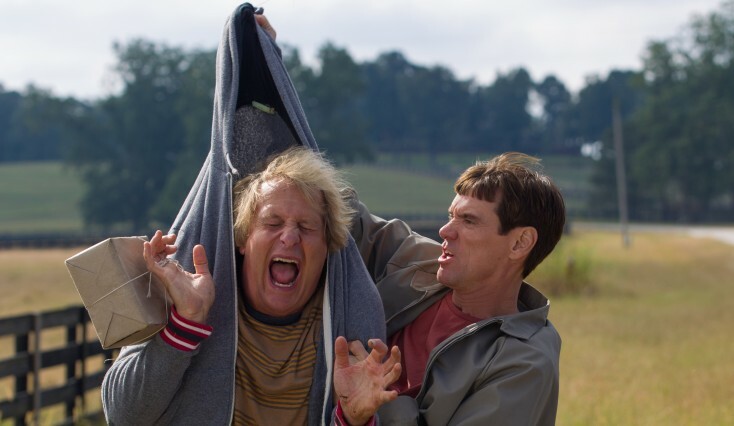 HOLLYWOOD—It’s been two decades since Jeff Daniels and Jim Carrey introduced the world to idiotic best friends Harry and Lloyd in “Dumb and Dumber.” In “Dumb and Dumber To,” the boys are older but definitely not a smidgen wiser. Audiences find out in the opening sequence that Harry (Daniels) has been dutifully visiting Lloyd (Carrey) every week at a mental asylum where the latter is in a catatonic state. During a random visit, Lloyd bursts out laughing and reveals that the whole thing has been a prank he has been waiting to pull on Harry. Why 20 years? Because it’s funnier, according to Lloyd’s logic. The same question could be posed to Daniels and Carrey, who basically agree that the time was right. Both actors have enjoyed successful careers since the first “Dumb and Dumber.” Daniels stars in the hit drama series “The Newsroom,” and Carrey has starred in numerous box office comedies and a few dramas in the intervening years. Arriving together for a press conference interview, it’s easy to see that these two men just picked up where they left off 20 years ago. 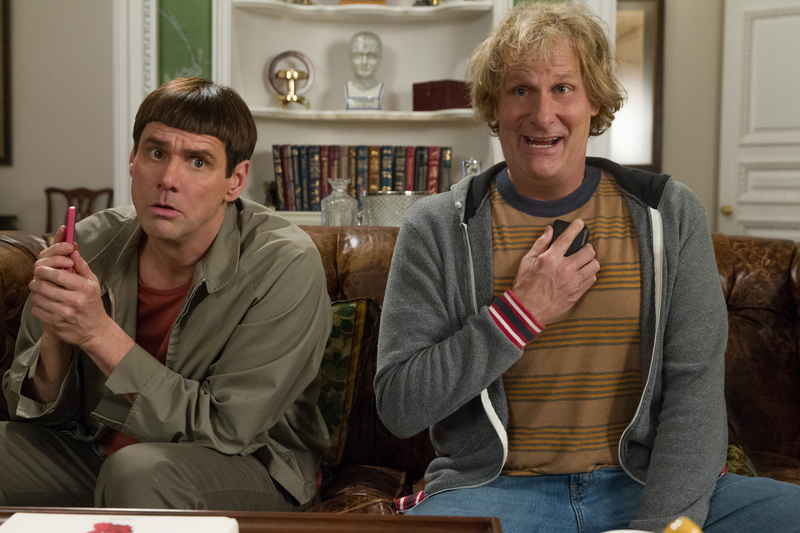 The comedy sequel, or as Carrey calls it “chicquel,” reunites them with their “Dumb and Dumber” co-writers/co-directors Bobby and Peter Farrelly. This time around, Harry and Lloyd go on a road trip to track down what they believe to be Harry’s long lost daughter. It’s not for sentimental reasons. Harry tells Lloyd he needs a kidney transplant and she may be the only one who can donate one. Q: Jim, the only other time you’ve revisited a character was for “Ace Ventura,” in which the sequel was done immediately after the first one. Did you have a preference for the approach of that or catching up with someone 20 years later? Carrey: I like to wait until the executives pass on before I do a sequel. I prefer that. I like to bury them and then do the sequel. Q: Jeff, you’ve never done a sequel, so how did you find the idea of revisiting a character you’ve played in the past? Carrey: It was a fan-driven sort of thing. They wouldn’t leave us alone. Daniels: The appeal of it wasn’t just 12-year-old boys. The demo kept getting wider and wider, so it demanded that it get done. And we all wanted to do it so it got done. Carrey: It’s cooler to wait. A sequel, when you wait 20 years, becomes a chicquel. Daniels: It’s a word. Look it up. Carrey: That could work in advertising. I think I just coined a huge phrase that’s going to change everything for everyone. Q: Peter and Bobby Farrelly say you guys have very different styles. Jeff, you just come in and do it, and Jim has to prepare for about six months ahead of production. Daniels: Wow, what a crock that is! Carrey: (laughing) I wouldn’t say six months. I start thinking dumb stuff a week before. You can’t trust anything those guys say. Lloyd is a part of me now. I just whack the tooth out. With some parts, you have to really totally get into it—the politics of the character and everything. There are a couple of things with Lloyd. You whack the tooth out, and you think really selfishly. You just go, “Mine! Mine! Mine!” in your mind. But also, the love between the characters is important. You can get away with anything as long as there’s real love between the characters. It’s like “The Honeymooners.” They were yelling at each other through the whole show, but you knew that Ralph loved Alice. So that’s the bottom line. Daniels: It depends which page of the script you’re on. You turn it and he’s more stupid than you are. Daniels: And then you do something stupid. I just think it’s something that passes back and forth. 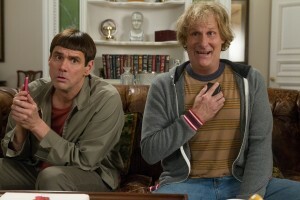 Carrey: Everybody gets his chance at the “Dumber” role. Daniels: Lloyd leads the way. He definitely leads Harry into some things. You’d think he would be the smarter one but the next thing you know, we’re face first in the wall. Q: How much over the past 20 years have you thought about these guys? Do they hold as special of a place in your lives as they do for the fans? Carrey: Every character I do is something special to me. (He burps.) You’re free. You’re free. Enjoy! That was a free-range burp. Why hold it? I’m an authentic person. Carrey: Oh brother. It’s definitely special. Every time you score with a great character relationship in a movie it becomes like your baby. It’s a special thing. And the fans made it special because they were constantly reminding me. I don’t remember yesterday. I pretty much live in the moment, but they’re really special. Daniels: They’re real people to us. Carrey: Lloyd feels like a separate person from me. Absolutely. Daniels: I always imagine that Harry is alive and well. Someday, he’s going to come and see the movie, and then he’s going to meet with me and tell me how I did. It’s a little game I play. You owe it to Harry or McAvoy (the character he plays in “The Newsroom”) or whomever you’re playing, to do them as authentically and believably as possible. You pretend like you’re going to have a dinner with them later and you hope it goes well. Q: Were you happy that some of the props from the original returned in this? Daniels: Yeah, I think they did a great job. We’ve got the Mutt Cutts (van). Carrey: I thought it was kind of funny to have it in there and then immediately destroy it. Q: Jim, you’d worked with Kathleen Turner several years ago in “Peggy Sue Got Married.” What was your approach in working with her then and now? Carrey: My approach in working with her then was to try not to get fired. I was just being a donkey on that movie. She was a big big deal back then. She was the first big star I worked with and it was great that she did this. There’s no ego in comedy. Keenan Wayans used to say that to me. You’ve got to throw it out the window. There’s no place for it. And with Kathleen, she just jumped in and did the most thankless possible choice, and I love her for it. Daniels: To walk up to Kathleen Turner and go, “Excuse me, sir”— you hope that day goes well. Q: Jim, is your daughter Jane in it? Carrey: No. She’s got music in the movie. She’s got two songs in the movie. Q: The Farrellys said you called them about doing a sequel after you caught the original on TV. Did you see it from the beginning or from the middle? Carrey: I don’t remember the genesis of this whole thing. I called them at some point and said, “We’ve got to work together again. Period.” That group of guys, as you get older, you value these things. You want to get back together with the gang. I want to hang out with (Daniels) and the Farrellys. Q: Where do you see these characters in another 20 years? Will they look different? Will their personalities be different? Or will they be exactly the same? Daniels: I think they’re exactly the same. Carrey: Lloyd will have lost an eye in a bar brawl. They don’t have an arc. There’s no life arc for these two. They’re going to fall into their grave stupid. Q: Jim, what other movies from your past would you like to sequelize?